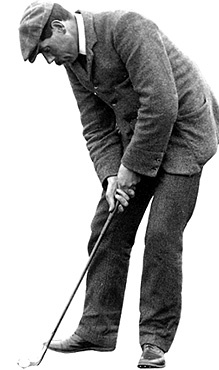 Born in Earlsferry (the other half of Elie) on 6 February 1870 and died in 1950, James Braid was one of the 'great trumvirate' (with Taylor and Vardon) of the early years of the twentieth century. He was the first golfer to win five Open Championships (1901, 1905, 1906, 1908 and 1910). He was runner-up in 1897, 1902, 1904 and 1909. Beginning his working life as a joiner he became a clubmaker against parental wishes, going south to London to work at the Army and Navy Stores in 1893. His reputation as a player spread and a challenge match was arranged with the then Open Champion J.H. Taylor which was halved, Braid recovering from dormie two down. This performance secured him a job as pro at Romford in 1896. He moved to Walton Heath in 1904. In addition to his skills on the course he proved a very successful president of the PGA and his legacy can be seen in the countless courses he designed, modified or offered advice on. His best-known creation is probably the King's Course at Gleneagles.